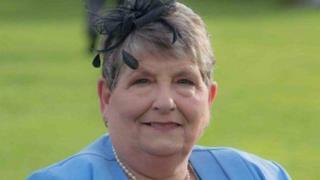 A learner driver who killed a pensioner while driving on the wrong side of the road has been jailed for six years. Thomas Devlin, 26, admitted causing the death of Isabella Miller near Cumnock, East Ayrshire in March. Devlin's Peugeot 307 overtook two cars, hitting one, before it collided with a Vauxhall Antara. His car came to rest on its roof and he ran off leaving Ms Miller, 68, trapped in the back seat of her daughter-in-law's car. Later when quizzed by police Devlin told them: "I thought both those cars had crashed before I hit them." He then stated: "Everything was just a big blur." The High Court in Glasgow heard that coincidentally, Ms Miller, who was from Dumfries, was a distant relative of the accused. The judge, Lord Burns, told Devlin: "You drove in what you accept was a dangerous fashion for a substantial period. "As a result of your driving Mrs Miller died. "You fled the scene without stopping. "This is a most serious offence a flagrant disregard for the rules of the road and the great danger caused to others." The court heard that Devlin overtook a Ford Focus at about 23:00 on 24 March and as he did so clipped the driver's mirror. He then overtook another car and drove at speed on the wrong side of the road before smashing into a Vauxhall Antara in which Mrs Miller was a passenger. Driver Donna Miller - Isabella's daughter-in-law - tried to avoid the collision and swerved but the car struck the kerb, rolled over and hit the Ford Focus. Ms Miller, who had four sons, five grandchildren and two great grandchildren, sustained fractures to her spine, ribs and pelvis and a tear to a major blood vessel. Prosecutor Angela Gray said the victim was pronounced dead at the scene at 23:30. She added: "The post mortem findings indicated that she would have died quickly on impact." Ms Miller, her son Mark and daughter-in-law Donna had been returning home from a birthday party at a bowling club in Cumnock. Devlin admitted causing the death of Ms Miller by dangerous driving on the A76 Kilmarnock to Dumfries, near Skerrington roundabout, Cumnock on 24 March. He also admitted a catalogue of other driving charges including not displaying 'L' plates, having no insurance, MOT or licence and and failing to stop. The court heard the learner driver obtained the Peugeot 307 for £100 on the day of the crash. Defence counsel Kevin McCallum said: "He expresses his profound remorse for his actions on that night." The judge ordered Devlin to serve a consecutive sentence of 11 weeks for failing to stop after the crash and banned from driving for eight years.